It's extremely rare to find a comic book film that simultaneously thrills while at the same time managing to be extremely human. The original Batman, though at first glance a special effects extravaganza with a good vs. evil storyline, turns out to be a much deeper character study with many more shades of gray than simply being black and white. Up to now, Tim Burton illustrated the torture and personal elements involved in being a superhero unlike any director. Now, with his second Spider-Man outing, Sam Raimi has created a universe that fully comprehends those shades of gray and indeed makes them the movie's theme. Picking up right where the first film left off, Spider-Man 2 is ostensibly about Spider-Man and his fight against mad scientist Dr. Otto Octavius/Doc Ock, but in reality it goes much, much deeper. Spider-Man 2 is truly Peter Parker's story, and we see him mature and come of age before our very eyes. At last, we have a superhero depicted as what they really are - a human being who bears the burden of being very different than others. And like all people who are just a bit different, it's hard to find a niche and to be comfortable in one's own skin. Meanwhile, the people with whom Peter had previously surrounded himself find him growing ever distant from them. Mary Jane, who has become a popular stage actress, realizes she cannot rely on him, while best friend Harry Osborn simply cannot reconcile that Peter has a connection to the villain who killed his father. Even Aunt May sees something in her young nephew that distresses her somehow. Peter's very personal journey takes place against a backdrop featuring a brilliant Dr. Octavius and his transformation from enigmatic genius to inescapable insanity. In his attempt to create a fusion reactor that will benefit society, things go terribly wrong and the doctor ends up fused to a set of robotic arms that gain control of his mind. 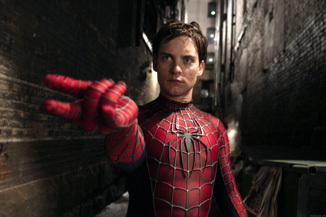 Though I was ambivalent about the casting of Tobey Maguire for the first film and in fact found his performance and the original movie itself only adequate, the depth and emotion he conveys in Spider-Man 2 prove him to be a very worthy choice. He possesses precisely the right combination of innocence and youth that the character requires, not to mention a slight tendency toward geekiness that is so important in the development of Peter Parker himself. The supporting performers are all marvelous as well. Both Kirsten Dunst and James Franco have more limited screen time than they did in the first film, but they are used to maximum effect. Dunst plays deeply injured and confused well, and Franco is truly emerging as one of the finer young actors in the business today. He is magnificent in his portrayal of a young man slowly descending into madness because of the grief in his heart. His interaction with Maguire is outstanding. Despite the fact that the film really belongs to Maguire as Peter Parker, Alfred Molina as Doc Ock/Otto Octavius is truly a revelation. He deftly conveys that Octavius is an ingenious and creative man who believes that man's responsibility is to make society better, and ably degenerates the character into psychosis as the mechanical arms take over his mind. His reaction to the arms themselves is phenomenal - whether fearful, pleading, accepting or completely possessed. Also important in his smaller, more comic relief-type role is J.K. Simmons as J. Jonah Jamison. He easily gets some of the film's best lines and takes overt glee in playing the character totally over-the-top. And I would be remiss not to make special mention of BOP favorite Bruce Campbell as Snooty Usher. Though he's onscreen for only a moment, he's obnoxious and funny. I really appreciate that Sam Raimi understands that casting Campbell and Ted Raimi in small roles is something special for those who have followed the director from as far back as The Evil Dead. As in the first Spider-Man, the special effects are truly remarkable. The web-slinging is better, if anything, but Doc Ock's robotic arms in particular are amazing. Each individual one has a personality of its own, and they are terrifying in much the same way that the original Terminator was frightening. They're machines, they are unpredictable, and they have an agenda. Spider-Man 2 does take some unique approaches to convey themes at times, which may make the pace somewhat off-putting to some viewers. For me personally, though, I loved these smart touches and winks at the audience. The music is also very cleverly used to accentuate the movie's tempo. Truly, the film is everything a superhero movie ought to be. It has terrific action scenes to pump the adrenaline, character development to help the viewer connect to the hero, and a villain whose sinister motivations are truly inspired in their lunacy. With trademark Raimi humor interspersed throughout, it easily stands as both a great comic book film and also just a wonderful movie in every sense.